Building science case studies are educating Maine home builders on the importance of properly managing moisture in new building construction. Best industry practices should always be utilized for weather sealing to prohibit bulk moisture from entering the structure. This includes proper installation of roofing materials and flashing detail, weather barrier wrap installation and sealing, window and door installation, and exterior cladding installation and detail. The following photographs detail proper window installation. Wall systems should be designed so that moisture vapor within the conditioned space is regulated from entering the assembly, yet able to dry either to the exterior or to the interior if it does enter an assembly. The first strategy to keep moisture vapor from entering the structure is extensive air sealing all gaps, joints and seams in the frame as air movement from conditioned to unconditioned space is the principal cause of moisture entering insulated assemblies. A few cans of DOW Professional foam and a little time effectively seals all sheathing seams, plate joints, window and door perimeters and mechanical system penetrations. Our current project, “Winkumpaugh Cottage” utilizes DOW “SIS” structural insulated sheathing which has a perm rating of 0.03 (twice as impermeable as 6 mil poly). This requires that wall systems be allowed to dry to the inside of the structure as it is nearly impossible that any moisture could dry through the sheathing to the exterior. But how can we prevent moisture vapor inside the structure from entering the wall system while at the same time allowing moisture vapor to dry to the interior? By installing a vapor retarder. Building science case studies have determined proper vapor barrier/vapor retarder recommendations for all climate zones based upon average heating degree days and projected dew points within wall assemblies built to a variety of specifications. In our climate zone, and with foam sheathed walls (the DOW SIS sheathing is continuous foam sheathing of R-5.5) it is recommended that a class III vapor barrier be utilized (class III requires permiance of less than 1.0 perm and greater than 0.1 perm). An excellent choice to accomplish these parameters is Sherwin Williams Vapor Barrier Primer. It is a latex based product and applied as recommended has a perm rating of 0.9. By any standard, this type of construction is both energy efficient and “tight”, so measures must be taken to ensure ongoing indoor air quality that is both healthy for the occupants as well as for the structure. We have specified Panasonic’s “Whisper Comfort ERV (energy recovery ventilator)” for this project. 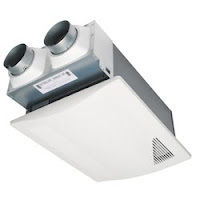 In place of a typical bath fan, each unit will provide a continuous air exchange for up to 500 sq ft and is 66% efficient at capturing the heat from the stale air being expelled from the structure. The near silent continuous operation (manual operation is also an option) consumes only 20 watts of electricity (less than most compact fluorescent light bulbs). While construction techniques that produce sustainable, energy efficient structures that are healthy to live in may cost a little more than the construction practices which have been prevalent for several decades, we believe they are well worth the difference. Would you be willing to pay more for a new home that is built to higher standards?